Ahope was created by taking aim at all non-profit organitaions and by strengthening it with hundreds of features. 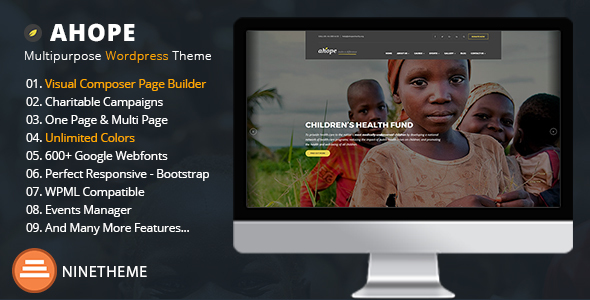 All parts that come together with the template are compatible with WordPress shortcode and Visual Composer structure. Therefore, we can promise that you will not come across with any surprises while building any page that you imagine. All pages of the template are built with the shortcodes which include hundreds of properties and you can easily build as many different pages as you like. We have added Total Donations, which is a very strong and flexible plugin, so that you can make appointment with your customers, you will not need to pay 37$ because it is integrated into the theme.